We’d love your help. Let us know what’s wrong with this preview of Mano tėvas Pablas Eskobaras by Juan Pablo Escobar. Pirmą kartą turtingiausio ir žiauriausio Lotynų Amerikos nusikaltėlio Pablo Escobaro gyvenimas iš taip arti. Tikri faktai ir tiesa, kurią atskleidžia paties Escobaro sūnus. Garsiausi nusikaltėlių pasaulio vardai Boni ir Klaidas ar net pats Alas Kaponė nublanksta prieš Kolumbijos narkotikų baroną Pablą Escobarą. Prekyba narkotikais jam pelnė septintą vietą turtingiausių pasau Pirmą kartą turtingiausio ir žiauriausio Lotynų Amerikos nusikaltėlio Pablo Escobaro gyvenimas iš taip arti. Garsiausi nusikaltėlių pasaulio vardai Boni ir Klaidas ar net pats Alas Kaponė nublanksta prieš Kolumbijos narkotikų baroną Pablą Escobarą. Prekyba narkotikais jam pelnė septintą vietą turtingiausių pasaulio žmonių sąraše. Kalbama, kad slapstydamasis nuo policijos kalnuose jis sudegino du milijonus dolerių tam, kad jo dukra sušiltų, o 10 proc. (apie du milijardus dolerių!) pelno kasmet nurašydavo kaip nuostolius, nes apytiksliai tiek pinigų suėsdavo žiurkės ar sutrūnydavo saugyklose. Nors Escobaras tiekė 80 proc. viso pasaulio kokaino, kariavo su vyriausybe ir žiauriai susidorodavo su konkurentais, jis buvo rūpestingas tėvas ir paprastų žmonių herojus – dalydavo pinigus vargšams, įrengė futbolo aikštelių vaikams. To ask other readers questions about Mano tėvas Pablas Eskobaras, please sign up. If there is no English translation I will read the spanish version but it will just take me a bit longer. Pablo Escobar is related to my family by marriage so I am looking forward to learning about this. Is there an English version of this book? Tyler Vachon This book is in English. So after watching Narcos last year, I had an urge to read about Pablo Escobar. I read a few articles, gawked at some of his photos, and sometimes got confused that why Wagner Moura wasn't in the pictures with his goofy smile and then realized that the real Pablo Escobar looked less handsome and was a real life narco and a terrorist who killed hundreds of people. I read "Killing Pablo" by Mark Bowden a few years back and to be quite honest, it was a bit of a slog. After finding no other book to read about Escobar, I read At the Devil's Table: The Untold Story of the Insider Who Brought Down the Cali Cartel, which was quite amazing. But that book dealt with Cali cartel, and my focus kept returning to Pablo. 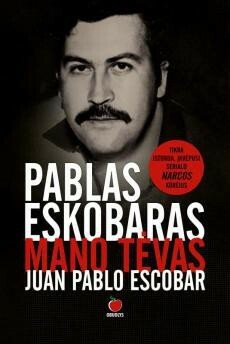 I knew that Juan Pablo Escobar, Pablo Escobar's son, has published his memoir about his father. At first, I was a bit skeptical. "Yeah, sure, he was your father. You're going to casually slide in some little good things about him in the book to make the readers sympathize with him." But nope. I was wrong. The kid (a grown man now) doesn't actually hate his father, but he knows what he was. And he accepts that honestly. My main complaint with Killing Pablo: The Hunt for the World's Greatest Outlaw was that that Mark Bowden looked at Pablo from really afar. He never goes to Hacienda Napoles and the zoo filled with exotic animals and birds which Pablo loved so dearly, for example. And to be fair, you either have to talk to an insider or you have to be one to have access to such information. And that is where this book shines. There are lot of things written in this book about the Medellin Cartel, Cali Cartel, Pablo Escobar, and his sicarios that would be hard to find elsewhere. So, if you're planning to read one book about Escobar, it should be this. But read "Killing Pablo" too as a companion book to learn how they eventually tracked him down. The most terrifying moments for Juan Pablo Escobar and his family (his mother and little sister) came after Pablo died. Many drug lords came to collect their dues and the Escobars had to pay them all even though by the time Pablo died, their legendary stacks of dollars were long gone. And Juan Pablo lived under constant fear of being killed by the Cali cartel until he left Colombia for good along with his mother and sister (They don't get along with Pablo's side of the family. Pablo's mother didn't get along with his wife as shown in the tv-series Narcos). Anyways, Pablo is dead, Cali cartel bosses are in jail in the USA, and the drug trade is still thriving in Latin America and millions in USA (and many other countries around the globe) are snorting it up as we speak. But my quest for learning about Pablo Escobar ends here, so all's good. Pablo Escobar and his family at Disney World. Pablo Escobar went to Disneyworld? For real? Mickey Mouse: can’t sell drugs here sir! This book was written by Pablo's son. So color me a skeptic. Whose word do I trust? Who is telling the truth? Escobar's son? Mark Bowden? The creators of Narcos? 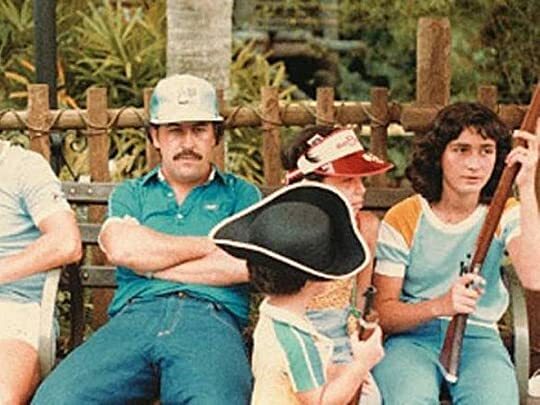 It's easy to feel sympathy for Escobar's family, but here's why you shouldn't- his Pablo Escobar and his family at Disney World. It's easy to feel sympathy for Escobar's family, but here's why you shouldn't- his son and widow have been charged with money laundering in Argentina. Sebastián Marroquín/Juan Pablo Escobar has been very vocal about his father over the past few years. He's acknowledged his father's crimes of murder and drug business. I don't think Escobar Jr has any illusions about his father. Να ξεκινήσω με λίγο χιουμοράκι λέγοντας ότι όταν είχα πρωτοδεί τον τίτλο του βιβλίου χουαν παμπλο εσκομπάρ ο πατέρας μου μου χε έρθει στο μυαλό ως μπασκετόφιλη και φουλ γάβρος το Βασίλης Σπανούλης ο μπαμπάς σας :p Μου ήρθε τι να κάνω να μην το πω? Στο προκείμενο τώρα. Μέχρι πριν φτάσω στις τελευταίες 2 σελίδες του βιβλίου αναφωνούσα κάθε τρεις και λίγο τι έγινε χουαν πάμπλο δε σου άφησε πολλά λεφτάκια ο μπαμπάκας και το έριξες στην συγγραφή? Το πα και αυτό να μη σας λέω ψέμματα. Το είπα όχι γιατ Να ξεκινήσω με λίγο χιουμοράκι λέγοντας ότι όταν είχα πρωτοδεί τον τίτλο του βιβλίου χουαν παμπλο εσκομπάρ ο πατέρας μου μου χε έρθει στο μυαλό ως μπασκετόφιλη και φουλ γάβρος το Βασίλης Σπανούλης ο μπαμπάς σας :p Μου ήρθε τι να κάνω να μην το πω? Στο προκείμενο τώρα. Μέχρι πριν φτάσω στις τελευταίες 2 σελίδες του βιβλίου αναφωνούσα κάθε τρεις και λίγο τι έγινε χουαν πάμπλο δε σου άφησε πολλά λεφτάκια ο μπαμπάκας και το έριξες στην συγγραφή? Το πα και αυτό να μη σας λέω ψέμματα. Το είπα όχι γιατί η ποιότητα του βιβλίου μου φάνηκε κακή αλλά επειδή τυγχάνει να χω περάσει ένα διάστημα όπου εγώ και οι ναρκοσειρές είχαμε γίνει ένα και ξέρω τόσες πολλές πληροφορίες για όλα τα καλά παιδιά των καρτέλ όπως τον ελ τσάπο ή τον εσκομπάρ σε τέτοιο βαθμό που μόνο επίτιμο μέλος δε με εχουν κάνει ακόμα σε κάποιο από αυτά οπότε θεωρούσα ότι το συγκεκριμένο βιβλίο μάλλον θα μου ήταν αχρείαστο στο κομμάτι των νέων πληροφοριών και δε θα ήταν τίποτα παραπάνω από μια αρπαχτή του υιού. Πράγματι λοιπόν δε μπορώ ότι έμαθα κάποια συγκλονιστική πληροφορία που εγώ προσωπικά δεν ήξερα ήδη. Παρόλα αυτά σε γενικές γραμμές το βιβλίο μου άρεσε αν και θα ήθελα να εμβαθύνει ακόμα πιο πολύ στο κομμάτι του εσκομπάρ ως πατριάρχη της οικογένειας και λιγότερο σε πληροφορίες ήδη γνωστές για τη δράση του. Βέβαια στο σημείο αυτό να εκφράσω την απορία μου ότι πως σκατά όλοι αυτοί οι narcotraficantes και αρχηγοί των καρτέλ σπείρουν το θάνατο μοιράζοντας ναρκωτικά και την ίδια ώρα αποτελούν υποδείγματα οι περισσότεροι οικογενειαρχών, στοργικοί και ρομπέν των δασών απέναντι στον φτωχό λαό. Πρόσφατα αν και ξεφεύγω από το θέμα παρακολούθησα ένα ντοκυμαντέρ για τον El chapo και μου έκανε τρομερή εντύπωση πως για τον Μεξικάνικο λαό θεωρείται σχεδόν λαϊκός ήρωας και πως ένας λαός χαμηλού μορφωτικού επιπέδου μεν έχει εναποθέσει τις ελπίδες του για μια καλύτερη ζωή σε αυτόν. I won't elaborate so that I don't spoil it for the following readers... It's amazing to read first-hand details of what this family, specially the children, went thru to survive a life they didn't choose. I know there are plenty of tv series that mimic Escobar's life. I've watched a few and can say that the most accurate, according to this book, is the Netflix "Narcos" series. Pablo Escobar'ın oğlu tarafından yazılan kitap aslında beklediğimden farklı çıktı. Neden derseniz eğer, oğlu tarafından yazıldığı düşünülürse ben bir yerde yaptığı illegal işlerin ardında kendini haklı çıkarabilecek sebepler olduğunu falanı filanı ve biraz da dram ve trajedi katarak anlatılacağını düşünmüştüm. Ama yanıldım. Beklediğim gibi değildi. Her şey olduğu gibiydi. Kesinlikle bir haklı çıkarma modu yoktu, Pablo Escobar'ın küçük hırsızlıklarla başlayıp büyük oynamasına kadar olan her şeyi olduğu gibi anlatılmış hissi uyandırıyordu. Ahh, bir de hani bakın o bir suçlu ama iyi bir suçlu halka yardım ediyordu imajı da verilmemişti. Ahh, evet halka yardım etmiş. Bunu anlatılan olaylar döngüsünde direk ifade etmese de olay içerisinde fark etmek mümkün. Karısını aldatmasını, karısının ona karşı tavrını... aşırı lüks yaşamlarına ve sonrasında nasıl sefalet düştüklerine... dostlarından akrabalarından sırtından bıçaklanmalarına kadar her şeyi anlatılmıştı olduğu gibi bu yönden güzeldi. Pablo Escobar'ın her şeye rağmen ailesine karşı olan sevgisi ise... bütün o pis işlerin arasında en gerçek olan şeydi bence. Kitap sadece Pablo Escobar'ın hayatına da değinmiyor, onun ölümü sonrasında ailesinin yaşadıklarını da anlatıyor. Neler yaşadıkları, nasıl zor durumda kaldıkları, nasıl tehdit edildikleri ve dahasında düşmanların istedikleri intikamı anlatıyor. Ancak çok fazla tarihi detay ve bir hayat hikayesi olduğundan akıcı ilerlemediği için zaman zaman okurken sıkıldığımı itiraf etmeliyim. Tüm o hukuki - emniyet birimleri ya da gizli ajan birimleri isimleri falan bir yer de hepsinin birbirine girdiğini ifade etmeliyim. Bir yerden de zaten atladığım sayfalar da vardı. Ama şunu söyleyebilirim ki bazı insanlar suçlu olmak için doğarmış... Okurken Pablo Escobar'ın da suçlu olmak için doğmuş gibi bir hissiyata kapıldım. Çünkü yaptıkları küçük hırsızlıklardan tutunda büyük uyuşturucu ticaretine kadar aklının çalışma tarzı pek de normal bir insanınki gibi değilmiş. Neyse, bu tür kitapları sevenler için güzel bir kitap olabilir ama benim tarzım değildi. Zaman zaman sıkıldığımı ara vererek okuduğumu ve bazen sayfa atladığımı itiraf edebilirim. Buna rağmen bir hayat hikayesi olduğu da düşünülürse benim için orta şekerde bir kitaptı. Written by the son of Pablo Escobar, he clearly outlines the price the family had to pay for a life they did not choose. At first, it was difficult to understand why his father was such a wanted man, then as he grew, Juan Pablo Escobar became very aware of the sheer violence and hedonism of his father. Once while traveling in an SUV with his father during the day time, his father was made aware that at a check point, agents were ready to capture and kill him. As his father pulled off to another l Written by the son of Pablo Escobar, he clearly outlines the price the family had to pay for a life they did not choose. At first, it was difficult to understand why his father was such a wanted man, then as he grew, Juan Pablo Escobar became very aware of the sheer violence and hedonism of his father. Once while traveling in an SUV with his father during the day time, his father was made aware that at a check point, agents were ready to capture and kill him. As his father pulled off to another location, and placed his family in another vehicle, when the got to the check point before his father, bullets rang through the air. Juan Pablo's mother and sister were in the vehicle as their lives were in danger. Not the first, or last time the family was in a very compromising position, increasingly as Pablo became more and more violent, the family needed to get out of the country. Going to the airport, packed and ready to go to Germany, agents stopped their plans, and the family could not go to another country. Held hostage by the government, they waited while Pablo hid out. Defenseless, the agents no longer agreed to protect the family. They were at the mercy of the many enemies of Pablo Escobar. At times this book seemed to go on and on. I appreciated that Juan Pablo did not make his father into a hero. But, he could have done that with far less pages. I've exhausted the need to learn more about the Cartel and the billions made while shipping cocaine to the ever addicted American public. بابلو اسكوبار، كثائر صغير، كمجرم جميل..
يبحث عن كل شيء، يريد كل شيء، يتخيّل نفسه كإله حيناَ وذليلٍ حيناً..
من تفهّم موقفه، لا أقصد موافقته، لكن تفهّمه وتقبّل دوافعه..
إن ثنائيات (أبيض- أسود) لم تكن موجودة يوماً، وحتى وأنت تبعد الآخر إلى الأسود على أساس عقدي مثلاً، أنت لا تكرهه لذاته، بل تك بابلو اسكوبار، كثائر صغير، كمجرم جميل..
إن ثنائيات (أبيض- أسود) لم تكن موجودة يوماً، وحتى وأنت تبعد الآخر إلى الأسود على أساس عقدي مثلاً، أنت لا تكرهه لذاته، بل تكره كفره بعقيدتك..
Oooodlično odrađena (auto)biografija. Ispunjena mnoštvom podataka i činjenica, fantastično ispričana, lijepo složena. Prati život od početka do samog kraja Pabla Eskobara, kralja kokaina, ali i ono što je uslijedilo nakon i sa čim se suočila njegova porodica. Sekiau šią knygą vos tik ji pasirodė lietuviškoje rinkoje: pirmosios apžvalgos, interviu su autoriumi Laisvės TV kanale. o Narcos serialas jau ilgą laiką tūno mano to-watch sąraše (planavau peržiūrėti vos baigius knygą) ir atrodo, kad ši knyga žadėjo tik patį geriausią laiką skaitant ją, bet įtraukė, o po to skaitant pradėjo labai labai erzinti. + įdo Sekiau šią knygą vos tik ji pasirodė lietuviškoje rinkoje: pirmosios apžvalgos, interviu su autoriumi Laisvės TV kanale. o Narcos serialas jau ilgą laiką tūno mano to-watch sąraše (planavau peržiūrėti vos baigius knygą) ir atrodo, kad ši knyga žadėjo tik patį geriausią laiką skaitant ją, bet įtraukė, o po to skaitant pradėjo labai labai erzinti. - už tą autoriaus paauglystės požiūrį į tam tikrus dalykus, kuris tiesiog drąskė man akis. Sakoma, jaunystė - kvailystė, bet manau tokių momentų gal visai nereikėtų demonstruoti knygoje, nes nei jie aktualūs, nei įdomuūs, tik greitai sunervina. At the risk of sounding obnoxious, I'm going to go ahead and label this book a MUST-READ for anyone who is a fan of Netflix's Narcos series. Recently having finished season 2 of that amazing show, I happened to stumble across this book, which I'd previously never heard of, at my local library. Well, obviously, I had to pick it up and immediately devour it. I was actually a little reticent to read it at first. There tends to be this phenomenon with TV series based on real-life events, where the bo At the risk of sounding obnoxious, I'm going to go ahead and label this book a MUST-READ for anyone who is a fan of Netflix's Narcos series. I was actually a little reticent to read it at first. There tends to be this phenomenon with TV series based on real-life events, where the book ultimately pales in comparison and tends to ruin the experience if read after having seen the show. Good Girls Revolt and Orange is the New Black are good examples of what I'm talking about. But, still, I decided to risk it with Pablo Escobar: My Father, and I'm so glad that I did. Far different from the show, the book is instead written from Pablo Escobar's son's perspective (which the title makes obvious). And instead of destroying my appetite for the show, this book actually enhanced my overall experience. This account of what was going on behind-the-scenes in Pablo's family works well as an accompaniment to the series. Assuming that most of Juan Pablo's revelations are in fact true, I learned quite a bit from the book that was not seen in the show! For example, the son's character in the show is much younger than he was in real life (maybe 10 in the show at the time of Escobar's death, yet 16 in real life). We also learn that Escobar's own family was working hand-in-hand with Los Pepes at the time of his death. Most surprising was one significant piece of evidence that is unveiled towards the end of the book regarding Escobar's death, but I won't spoil it for you. I received a copy of this book for free through a Goodreads First Reads giveaway. I only know the basics about Pablo Escobar: he was a drug kingpin, he was incredibly wealthy, he was ruthless and he was murdered. This book gives us a look at the family side of Escobar and, for lack of a better term, his softer side. It's an inside look from a son about his father, therefore it is rarely critical of the choices made by the father. Juan is clearly disturbed by what his father did and the havoc he c I received a copy of this book for free through a Goodreads First Reads giveaway. I only know the basics about Pablo Escobar: he was a drug kingpin, he was incredibly wealthy, he was ruthless and he was murdered. This book gives us a look at the family side of Escobar and, for lack of a better term, his softer side. It's an inside look from a son about his father, therefore it is rarely critical of the choices made by the father. Juan is clearly disturbed by what his father did and the havoc he created but also offers no apologies for the lavish lifestyle that havoc provided his family while growing up. One issue that bothered me is that Juan writes with feeling and heartbreak when one of his own family members or friends is murdered because of the "drug war" in Colombia. However when Pablo orders the murder of others, including non-corrupt police and civilians/innocents, he glosses over it as just another day in the life of Pablo Escobar. He apologizes on his father's behalf for those that have lost loved ones, but it's little consolation. It would have held more weight if it had been pointed out that a portion of the proceeds of the book sales would go to some form of charity to support victims of drug violence (or violence in general) either in Colombia or his adopted home of Argentina. Perhaps some proceeds are being donated, but it should be made obvious. كتاب رائع يتكلم عن شخصية أثارت الكثير من الصراعات في كولومبيا على وقته، إنه أكبر تاجر مخدرات عرفه البشر حتى اليوم، بابلو إسكوبار. يتكلم الكتاب -الذي تم تأليفه من قبل ابنه- عن حياة بابلو و كيف أصبح تاجر مخدرات و عن احامه و طموحاته، التي من وجهة نظري كانت رائعة لكن طريقة تطبيقها كان مرفوضا إطلاقا و كان عبر الكثير من الجثث و الإرهاب! أتمنى أن تتم ترجمة هذا الكتاب للغة العربية قريبا. I'm not sure how credible a narrator PE's son is because he was only 16 when his father was killed and I don't know how sophisticated a teenager is in understanding the motives of the leader of an international criminal enterprise, Interesting back stories nevertheless, Just read it with a grain (or shaker) full of salt. I found this book hard to follow for a few reasons. There were way too many names and organizations to keep track of. It would've been helpful to have a chart or breakdown at the beginning of the book differentiating who was family, who was friend and who was foe. The author also skipped back and forth in time periods at some points, which made it confusing. If you have even a mild interest in Pablo Escobar, you probably won't find a lot of new information in this book. There were a few personal I found this book hard to follow for a few reasons. There were way too many names and organizations to keep track of. It would've been helpful to have a chart or breakdown at the beginning of the book differentiating who was family, who was friend and who was foe. The author also skipped back and forth in time periods at some points, which made it confusing. If you have even a mild interest in Pablo Escobar, you probably won't find a lot of new information in this book. There were a few personal insights included, but reading about a mega rich family evading the law and hiding out, no matter how "great" of a father Pablo Escobar was, just doesn't feel right. I also have a hard time believing that Juan Pablo and his mother were completely innocent and pure people after Pablo died. At the end of the day, I didn't really gain any information or joy from reading this book. Tedious. Teniendo tanto libros hablando de Pablo Escobar, así como películas y la famosa serie narcos de netflix, quería adentrarme un poco más en el lado familiar, ya que en este libro habla su hijo Juan Pablo Escobar. Juan Sebastián Marroquín, que ahora se llama asi, nos narra desde los inicios del trapicheo de su padre con el narcotráfico hasta la caída del capo más sanguinario y despiadado de colombia, así como el después de la familia y de cómo rehicieron sus vidas. me ha gustado porque no esquiva las Teniendo tanto libros hablando de Pablo Escobar, así como películas y la famosa serie narcos de netflix, quería adentrarme un poco más en el lado familiar, ya que en este libro habla su hijo Juan Pablo Escobar. me ha gustado porque no esquiva las tropelías y barbarie de su padre, no es un relato edulcorado. al final deja claro una lección: hay que seguir la senda adecuada y vivir en paz. The book starts off with the author being a tad defensive about his father, the most notorious drug lord in history. However, as the book progresses, it becomes very clear that the author was a victim himself being born into this world of crime and not having a way out even though he wanted his father to stop. As Escobar's son, he was privy to some of the most intimate details about the kingpin's personal and criminal life, which explains the extraordinarily detailed descriptions presented in th The book starts off with the author being a tad defensive about his father, the most notorious drug lord in history. However, as the book progresses, it becomes very clear that the author was a victim himself being born into this world of crime and not having a way out even though he wanted his father to stop. As Escobar's son, he was privy to some of the most intimate details about the kingpin's personal and criminal life, which explains the extraordinarily detailed descriptions presented in the book. Even with the unspeakable crimes and atrocities committed by Escobar, you cannot help feeling touched by his love for his family and even feeling sorry for him during his downfall. Definitivamente Juan Pablo no es escritor así que obviamente no es mucho lo que se puede rescatar de su narrativa al contar la historia de su padre sin embargo vale mucho la pena leer de primera mano los sentimientos, situaciones y características que rodearon la vida del hombre que durante varios años azotó Colombia con una despiadada ola de violencia. Aún hay muchas más facetas que tiene el libro pero definitivamente tratar de ver desde uno de los ojos cercanos a El Patrón es el mayor incentiv Definitivamente Juan Pablo no es escritor así que obviamente no es mucho lo que se puede rescatar de su narrativa al contar la historia de su padre sin embargo vale mucho la pena leer de primera mano los sentimientos, situaciones y características que rodearon la vida del hombre que durante varios años azotó Colombia con una despiadada ola de violencia. Aún hay muchas más facetas que tiene el libro pero definitivamente tratar de ver desde uno de los ojos cercanos a El Patrón es el mayor incentivo que hace leer este libro. Nesidomint Escobaro persona, knyga apkrauna daugybe detaliu ir pavardziu, kurias sunku isiminti. Didesnis isitraukimas pasiekiamas paskutiniuose skyriuose, taciau bendrai - ne itin idomus pasirinkimas. An engaging, deeply emotional autobiography by the son of Pablo Escobar. Like a lot of other people I blasted through the T.V show Narcos with great delight. An enjoyable series with plenty of action and a gripping story line. But here's the rub You forget that these were real people and events that took place. So after I'd finished I decided to take a deeper look in to the real Escobar and that's when I came across this book. I was interested to find out what his son had to say about the real man. Juan starts of at the end of his tory after Escobar had died Showing Like a lot of other people I blasted through the T.V show Narcos with great delight. An enjoyable series with plenty of action and a gripping story line. But here's the rub You forget that these were real people and events that took place. So after I'd finished I decided to take a deeper look in to the real Escobar and that's when I came across this book. I was interested to find out what his son had to say about the real man. Juan starts of at the end of his tory after Escobar had died Showing us the turmoil that followed in the wake. Then going back to were it also started. He does a great job in plotting out all the major event that took place as well as giving us some insight it to what it was like to have a father so well known for his criminal activities. And I like the contrast it gives a man who many thing the know a different perspective. That is not to say that he shy's away from that horrific acts that were carried out. It must be a difficult place to find you self in. How do you balance the two sides together. When it come to our a parents we all have an image of them that we hold dear. But when it is shown in the papers and on the nightly news that it might not all be good what then. This was an interesting read and the author managed to convey a great deal of information. Not only about himself but his father and the history of Colombia at the time. While at times you could pick out the bits that showed up in the T.V series it add so much more to my understanding of the man and why he chose to do the things he did. His ability to help those in need in the community from building schools and hospitals and making sure that the children of poor family's had presents on Christmas. On the other hand he had no problem in killing people on a whim and exploding bombs across the country. Jaun shows us that while he doesn't hate his father he has come to terms with who he was. The amount of death Pablo caused by he own direct hand or by that of the drugs he imported into the U.S will probably never be known but you must figure its way up there. I think the book benefits well for showing the family life of Escobar rather than only focusing on that of his empire. Many books have been written on that subject and I'm sure they are good reads. He apologise many times for the actions carried out by his father through the book. Saying he didn't known a lot of the things he was up to. I realise some doubt this but how much could the young boy of the time really know . All we can do is take his word for it. This is the story of the most powerful drug lord in history narrated through the eyes of his son; the everyday language used by Juan Pablo Escobar to write this tale allows us to submerge into the everyday lives of the Escobar family until the end Pablo and further. He is quite honest regarding his father’s acts of violence as seen through his eyes as a kid and about his own feelings of guilt towards the victims even though that guilt wasn’t his to bear. He also gives us a humility lesson by ext This is the story of the most powerful drug lord in history narrated through the eyes of his son; the everyday language used by Juan Pablo Escobar to write this tale allows us to submerge into the everyday lives of the Escobar family until the end Pablo and further. He is quite honest regarding his father’s acts of violence as seen through his eyes as a kid and about his own feelings of guilt towards the victims even though that guilt wasn’t his to bear. He also gives us a humility lesson by extending the olive branch to his father’s victims in order to show us that it is possible to achieve forgiveness and peace for both parties if only we set aside our pride. For me this book is a must read because the more we know about the true story of these events the less likely it is that we’ll repeat it; as hard as it is to address this kind of issue it still is a very important chapter in universal history and we should all know its causes and consequences for everyone involved: the family who is still carrying the weight of their patriarch’s faults, the victims who suffered indescribably because of someone's need for everyone to bow his wishes, the country whose people are still treated as drug dealing suspects, the world not only about health issues of the drug itself and the violence it ignites but by the media who describes the drug lords as role models. This book has a very clear message and it is to NOT idolize the kingpin of cocaine but to understand that this is not a desirable life for anyone and can bring true suffering to a lot of people including one’s family. La Historia del Narcotraficante mas importante de la Historia, contada a traves de los ojos de su primogenito en el que desde el seno de su familia narra las aventuras desventuras de ser parte de una de las historias mas oscuras de colombia y que se ha expandidio por el mundo. JSM o decir JPE nos narra de un lenguaje coloquial excelente, todos los pormenores de la historia de su padre y como esta aun despues de adulto la sigue cargando, en culpas y glorias hasta el extremo de enemistarse con su La Historia del Narcotraficante mas importante de la Historia, contada a traves de los ojos de su primogenito en el que desde el seno de su familia narra las aventuras desventuras de ser parte de una de las historias mas oscuras de colombia y que se ha expandidio por el mundo. I absolutely loved Narcos on Netflix so I thought I'd give this a go. Unfortunately, I couldn't get into the book. Maybe I just have a weird crush on Wagner Moura as Pablo Escobar. Who knows, hijo de puta? From the pages I did read, I learned that the real el patron loved to take three hour showers!